Other sources: On this page will be found e-mail, postal and telephone contacts with all things to do with Horse Drawn Vehicles. Plus links and reference to sites, books articles or museums etc. that may be of interest to the SMHDV devotee. Sometimes a single HDV, (maybe the last of its kind), housed in a collection or even locked away on its own and rarely viewed by anyone will be show here. If you know of such a vehicle, maybe an obscure link to it that you feel should be shared by others, please e-mail me with the relevant information. If you have a photograph of a vehicle and can provide information and something of its history then send it here. Do look in the miscellaneous section towards the bottom of the page! Where other plans can be obtained. Clubs, societies, museums and associations. Where finished models can be purchased. Any information and subjects that might be included would be most welcome. The aim of the Guild is to promote precision scale modelling of horsedrawn vehicles and related items as a non-commercial hobby by means of construction from scratch. Members exhibit regularly throughout England mainly at Model Engineer, County and Agricultural shows. Membership to the Guild is open to anyone, and there are two categories of membership. An Ordinary member is a person who has constructed models to a good standard and expressed the intention to show them at several of the exhibitions staged by the Guild each year. An Associate member is someone with an interest in the activities of the Guild but not satisfying the requirements for Ordinary membership, (Not an actual modelmaker). The spouses of Ordinary members are automatically Associate members. A magazine which is only available to members, is published about three times a year and contains reports from shows, guild news and diverting articles and activities as well as a few technical hints and tips. Take a look at the Guilds website www.guildofmodelwheelwrights.org for more information and where there is also a gallery of model carts and wagons made by Ordinary member. You can get a large selection of Horse-Drawn Vehicle Plans from here, and for those of you who decide that you do not want to make your own wheels, you can get wooden wheels, and moulded wood finish plastic wheels in a variety of sizes. If you click on the “Other Parts” link you will be directed to a page offering scale size coachbolts and nuts. The bolts are chemically blackened steel and the nuts are made of brass. The four sizes are similar to those which Lenham Pottery used to sell, but scaled to specifications based on the actual full size bolts. There is a size chart giving the dimensions of all four sizes so that you can work out exactly what you require for your model. The Museum of English Rural Life, The University of Reading, UK. The only source I know of where you can get David Wray plans from…………..
You can request a list from the above address of the David Wray Collection of Waggons, Carts, Drills, Ploughs and Agricultural Implements. A number of John Thompson plans can be purchased also. Hand-Coloured Dyelines, and a large collection of photographs of Carts and Waggons, are available. A set of drawings of Pitstone Windmill is available, there are 8 sheets of drawings covering all details of the mill. This is the first and only set of drawings to provide accurate and complete information on a windmill. The Oregon Historical Society www.ohs.org is the home of a remarkable collection of miniature scale model animal-drawn vehicles, built by Ivan Collins (1906-1971). Ivan spent more than thirty years meticulously researching and constructing these models. Reproductions of selected wagon plans and selected drawings are available in sets ranging in price from $6.50 to $35.00. Some of the originals are in the collections of the OHS regional research library. A completely redesigned edition of the book "Historic Vehicles in Miniature: The Genius of Ivan Collins" is now available, with informative technical notes on all 63 models, and large full-color illustrations of each of these models. (List Price: $21.95 Paperback). 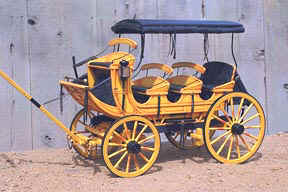 The CAA www.caaonline.com was founded in 1960 and is the oldest and largest international organization devoted to the preservation of historic horse drawn vehicles. The CAA, which is dedicated to the proper preservation, restoration and care of these carriages and sleighs, also encourages the fine art of driving them. The Association has more than 3,500 members in 25 countries. 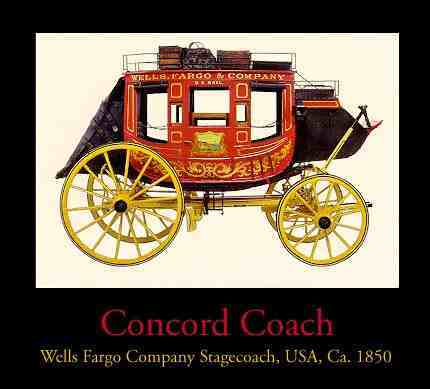 This site is well worth a visit, as there are a number of very fine photographs of horse drawn vehicles, like the "Wells Fargo" Concord Coach, shown left. The Cobb & Co. Museum is situated in Toowoomba, Queensland, Australia. The original Museum was developed to house the Bolton Collection of 28 horse-drawn vehicles. Together with carriages from the Queensland Museum’s own collection and others acquired since. The museum displays Australia’s finest collection of horse-drawn vehicles. This link Cobb & Co Museum will take you directly to the National Carriage Collection page where there are over 40 thumbnail pictures of a wide range of horse-drawn vehicles, including a Station Wagon, (shown above) Piano box buggy, Farmer’s spring wagon, Horse caravan and two superb Cobb & Co. coaches. Each vehicle has a description and history and any SMHDV enthusiast will without doubt bookmark this site. The Mischka Farm www.mischka.com bookstore issues a catalogue listing a huge choice of books, including Draft Horse Books, Barn Books and Horse Drawn Vehicle Books. They are the world's largest publisher and distributor of books, videos and calendars dedicated to the draft horse, mule and driving horse enthusiast. Dont miss this web site. The "Yellowstone Coach" shown on the left is 23x15x12, and is just one of a number of superb model horse drawn vehicles that are currently for sale. Contact Dale at: www.westernfineart.com Dale's work is on permanent display in museums and some of the most prestigious corporate and private collections in the U.S. and abroad. He has made eighty different horse drawn vehicles. Each is made with great detail by hand from hundreds of individual pieces of hardwood, steel and leather, and all are museum quality. To see 4 other superb vehicles of Dale's go to the ''Model Gallery'' page. I came across THIS page on the internet quite by accident. It’s a lovely account of past times when the Gypsy caravans or vardos would be seen not infrequently at hop picking time or sometimes meandering along a quiet country lane towards some distant hamlet. 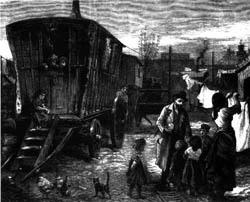 Janet Keet-Black paints a memorable picture of this age and gives a most interesting account of Gypsy lore, their living wagons and the people who built them. Don’t miss clicking on this link. 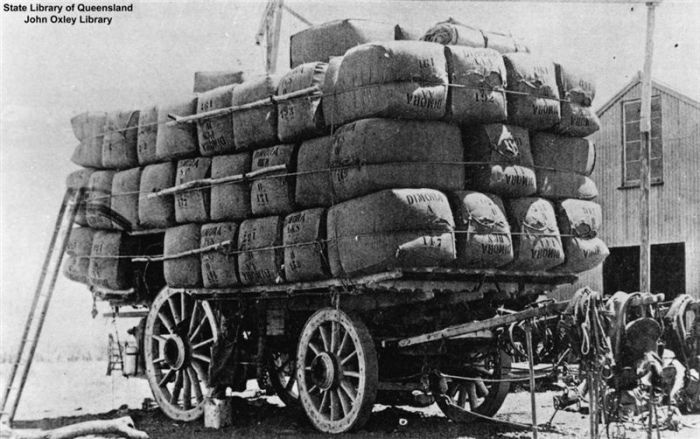 Take a look at THIS picture sent in by Radish showing these huge loads of wool bales on these wagons. Don’t miss clicking HERE to see this outstanding 1/12th. scale model made by Radish. The bales, incidentally, were made by the wife of a friend of Radish’s who is a ‘dab hand’ on the sewing machine. Donald Martin has THIS web site about this little known but remarkable vehicle which is located in his local museum in Owen Sound, Ontario, Canada. 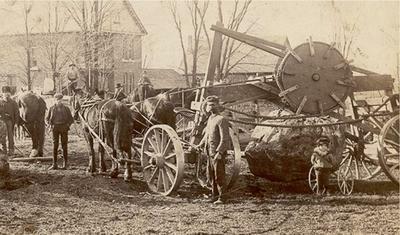 This Horse Drawn Vehicle was used in this area (Niagara Escarpment) to clear glacial erratic from fields. There are a number of detailed photos, (courtesy of the Grey County Archives), and an Artist's Conception of how it was used. Donald is appealing for information on this stone lifting machine, where they were used, their development, manufacture and any information about the builder, John Craig. These legendary 20 Mule Team's actually consisted of eighteen mules and two horses which were hitched to single trees and then double trees hooked into an eighty foot long chain which ran the length of the team and fastened directly onto the lead wagon. 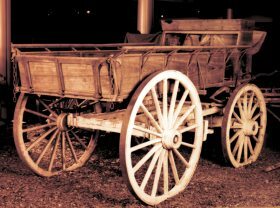 The rear wheels of these huge wagons were 7 feet in diameter, with the front wheels measuring 5 feet in diameter. The steel tires were 8 inches wide and 1 inch thick. The wagon beds were 16 feet long, 4 feet wide and 6 feet deep. Each wagon weighed 7,800 pounds and each "train" of two loaded wagons carried 20 tons of ore and a water wagon.~over 36 tons were pulled by these twenty mule teams. 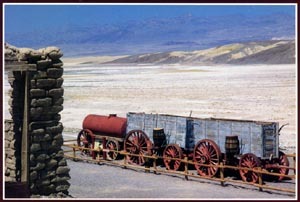 The borax load had to be hauled 165 miles up and out of Death Valley, over the steep Panamint Mountains and across the desert to the nearest railroad junction at Mojave. The 20-day round trip started 190 feet below sea level and climbed to an elevation of 2,000 feet before it was over.Take a look at THIS LINK for more info and pictures – especially the 7th picture on this page to get an idea how huge these wagons were. Then scroll down towards the bottom of the page and click on - Ghosts of the Past 1 - The 20 Mule Team. I came upon THIS SITE quite by chance, and was immediately captivated by the magnificently carved and brightly painted Gypsy Waggons shown on these pages. I remember when I first saw the book cover of "The English Gypsy Caravan" By Denis Harvey and CH Ward-Jackson, showing the intricate carving on the porch brackets, undercarriage, shafts and wheels etc; then shortly after I obtained John Thompson’s plans of the Ledge Waggon. I have started making this lovely model, but it is nowhere near completion yet. Over the past 27 years I have seen a number of Ledge Waggons at shows, but only a very few that could be classed as outstanding regarding the construction and finish! Anyone attempting this model, which will take a number of years to complete to museum standard, would do well to take a look at the pages of this delightful site. Notice the changing pictures on this first page, and then click on ‘Slide Show’ and ‘Work in Progress’. 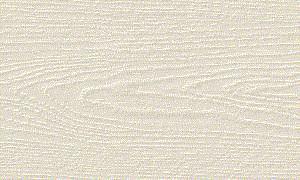 Detail of the interior is also shown, and can give the model maker ideas and inspiration in attempting a model. Enjoy!